Antonio and Paolo live happily together in Berlin and are finally getting married. They decide to celebrate in the small Italian village where Antonio grew up. While his mother immediately supports his intentions, her husband, Roberto, the town mayor, is much more reluctant. Paolo, who has not spoken to his conservative mother in a long time, must get her to the wedding as a condition of the marriage. Throw in a couple of wacky roommates and the aisle to the altar is paved with hilarity, hijinks and lots of love! 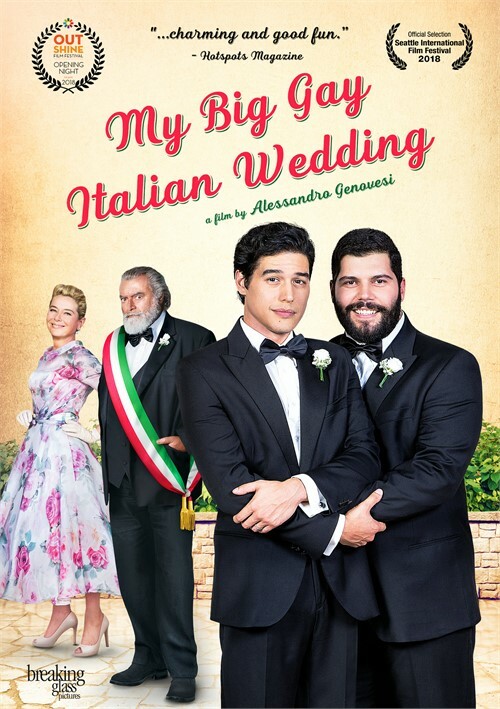 "My Big Gay Italian Wedding"
"My Big Gay Italian Wedding" is a feel-good comedy that requires nothing of the viewer except a few chuckles. Antonio (Diego Abatantuono) and Paolo (Salvatore Espoito) are two Italians happily living together in Berlin. 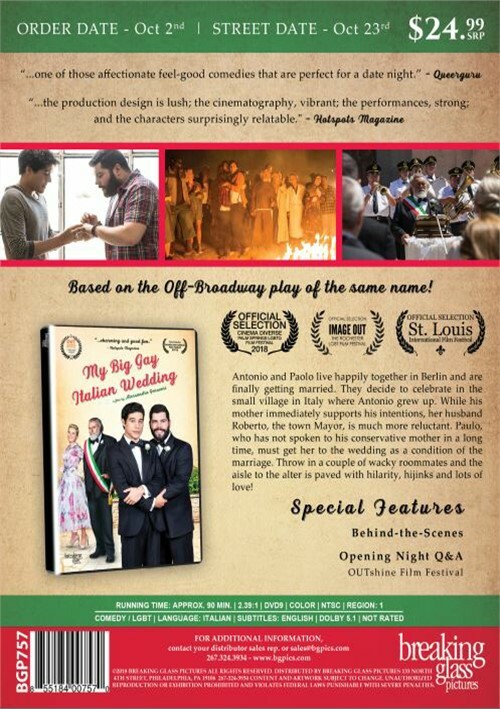 The night before Antonio is about to make his annual Easter trip home to visit his parents, he proposes to Paolo who then insists that they should now go on the visit together. Antonio is reluctant to agree as he has still hasn't come out to his parents. They are soon in an Italian picturesque mountaintop small town with their two zany roommates and Antonio's mother immediately supports her son's intentions. She insists on throwing a lavish wedding right there in town but with two conditions. Antonio's father the Town's Mayor should officiate and secondly Paolo's mother should be there too. This is when the problems start as his father refuses to have anything to do with his son's wedding, and Paolo's mother has not spoken to her son for three years ever since he came out to her. Because this is a comedy, we know that everything has to work out but we also have to have fun. The fun includes a great deal of silliness involving a camp Reality TV star wedding planner, and even the hijinks of the one girl that Paolo spent a drunken night in his childhood, and who still carries a very large torch for him. Alessandro Genovesi co-wrote and directed and he paid attention to the smallest detail and high production standards. Be warned--- the ending is campy and way over-the-top.